superdumb supervillain: Scarry Stories on TV! 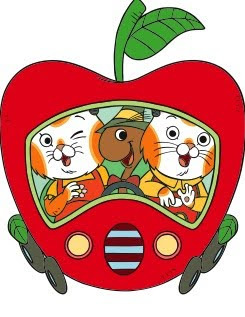 Busytown Mysteries, an animated series based on Richard Scarry's beloved characters, is coming to network TV! 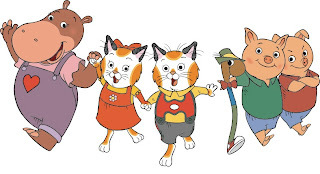 Busytown Mysteries will be part of CBS kids' weekend lineup, Cookie Jar TV. Click here to see when it will show in your area! We received a two-episode Busytown Mysteries preview DVD and Roo and Jasper loved it so much that they wanted to watch it over and over again. They call it the Huckle show, after the lederhosen-clad kitty protagonist. I got a big kick out of watching them sing along with the Who! What! When! Where! Why! song that helps the gang use deductive reasoning to solve everyday mysteries in Busytown. 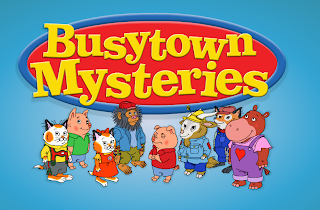 Kids can also experience Busytown on the computer at BusytownMysteries.com, an interactive website that features 14 different games and activities specifically designed for preschoolers. They can pick their own animal and silly car to use as they navigate through the neighborhoods of Busytown and interact with their favorite characters. Disclosure: We received a two-episode DVD of Busytown Mysteries to review. By writing this post, I will be entered into a contest to win a gift card, but honestly I was just curious to see the show. And, yes, it is very cute. Busytown was on Saturday morning and it warmed my heart. I have such great memory's of RS's books growing up. In fact, I still have a few. I LOVED his books growing up. Something about all those creative cars and town stuff. His books were the first two I bought for SoJo when I was pregnant, and we're enjoying them now. I was surprised how much Jojo liked this show too. Deeds only likes choo choos and "Bob Bo" (Bob the Builder) right now. Elli and I watched some of these the other while I was trying to get her to take a nap. She seemed to really like them!